I bought these suede fringed heels from ASOS last year, but then I sprained my ankles and mostly wore (and wore out) my Green Flash trainers or flats for about two months. I’d almost forgotten them until a few weeks ago and have been wearing them a lot since. They’re most excellent. 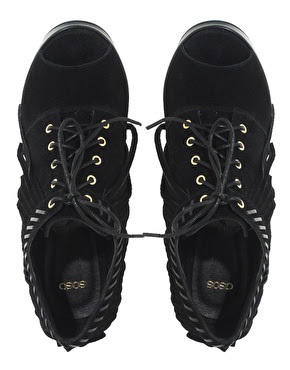 Suede wedge shoe boots with fringed detail, peep-toes, and lace-up front with gold tone eyelets. They also came in a vibrant electric blue, but I already have bright blue shoe boots so opted for good old faithful wear-with-anything black. I don't really rate the whole 70s fashion revival, so the suede fringing is my subtle nod to The Decade Which Fashion Forgot. They make cool swishy noises and remind me of long-haired Shih Tzu dogs which, as far as I'm concerned, is pretty cool too.